Elba is a quaint, friendly town nestled in the North Loup River Valley, where our elderly are rich in ethnic heritage. Our youth are our future and are proud of their heritage. Polish, Czech and Dane are some of our predominant nationalities. February starts the year with a bang—–“The Kolache Shoot-Out” one of many events that celebrate our heritage. Our town is nestled in the entrance of the beautiful North Loup River Valley and surrounded by 3 lakes, all within an hours’ drive. 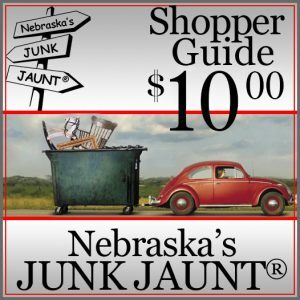 At the information booth, located on the corner of Highway 11 and Pearl Street, you can pick up a JUNK JAUNT® Vendor Guide and a detailed map of Elba.